I’ve written before about how the UK’s postal address file not being available under an open commercial license stifles innovation . In that case I gave the example of my Leeds Bins app. Users expect to type in a postcode and pick their address and this process is harder, more costly, and less reliable than if the PAF was available under an open license. In part because I have to pay for postcode lookups, but more importantly because the addresses returned from those lookups don’t always exactly match the addresses (with an associated bin collection timetables) released as open data by Leeds City Council. Here I want to give another example where closed or unclear data is stopping me from doing more things and creating new products. Over the past year or so, me and Dan have been developing ward-level hexmaps as a way to visualise data at a local level. People love them. One of our most popular examples is our home sale price tool. 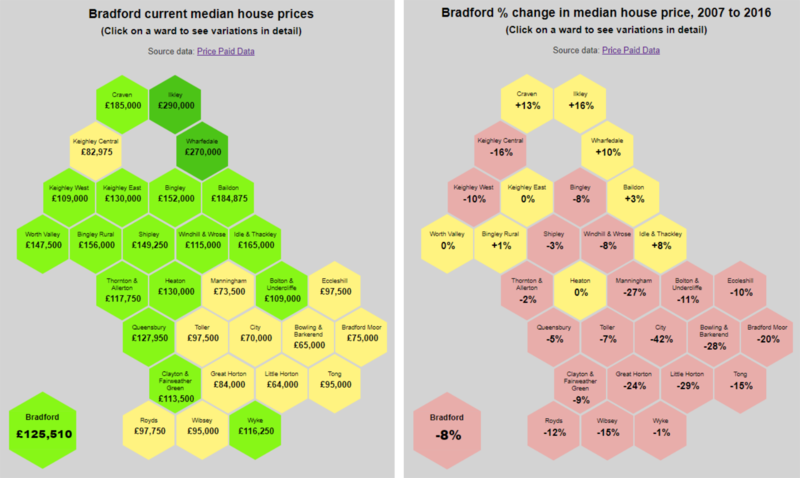 It lets people explore current prices and how they’ve changed since 2007 and 1995, at ward level. They compare with their neighbours, their family, their friends. Below is an example for Bradford. People always get in touch and ask us if these hexmaps are available for where they live, and although we’ve done about a dozen local authorities, the answer is usually no. But it’s not because we haven’t done the calculations — we have. And it isn’t because we haven’t created the hexmaps for every ward in England & Wales. We’ve done that too. The reason that this work isn’t available, and the data that we’ve calculated at considerable expense isn’t open data, is because we aren’t sure whether using and/or releasing the data is legal. This is, again, due to PAF licensing and I can’t wait for it to be fixed.